Blah Blah Bklyn: Happy Diaversary to Me! Today marks the 17th anniversary of my diagnosis - 17 whole years, kids! Years of all the stabbing, poking, and bloodletting involved in the maintenance of my Type 1 jalopy. Years of battling the food 5-0, keeping up with advances in medical technology, and becoming more engaged in the D community. Years in which I somehow shifted from a 15-year-old kid whammied by the fickle finger of fate to a self-sufficient adult who might be a little more cyborg than she'd like. Oh, how I loved Laugh-In. How in the hell has so much time passed?! It feels like just yesterday I was sobbing in Hannaford's jelly aisle, totally overwhelmed at all the sugar in the foods I loved to eat, completely unable to wrap my head around my brand-new disease, and feeling oh-so-alone and incapable of handling things. And now here I am, writing a dblog post while plugged in to my pump and Dexcom, smugly pleased that the cheese I just noshed should have zero effect on my current smooth-sailing CGM graph. 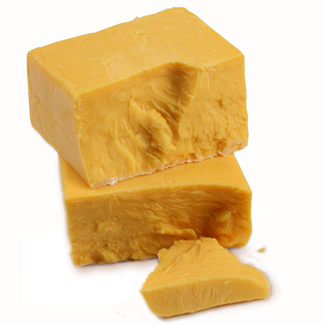 I love cheese WAY more than Laugh-In. Mmm. Cheese. 2. Test more often, and more randomly. My meter is a solid 10-20 points higher than Dex because I test more often when I'm trying to bludgeon my BG down into a normal range. 3. Prioritize staying in touch with you crazy, wonderful, cupcake- and bacon-obsessed DOC folks. It's important. It keeps me focused...but not stalker- or serial killer-level focused. More like a relaxed, calm person who's in control but not insane about it focused. 4. Move more. My BGs will thank me for it. 5. Buy new gear: an updated medical ID tag, and a less fugly meter case. Now don't get all worried about the woo-woo level here. You'll be relieved to know it's not all about hand-holding, singing kumbaya, and getting in touch with my feelings. Every December I also like to throw myself a little "It's my party and I'll be high if I want to" gathering - sometimes it's a trip to an ice-cream place, sometimes it's a date with appalling quantities of pizza, and sometimes it's a multicourse dessert potluck at home. But whatever it is, the point of the diaversary celebration is the same. It's my chance to flip the bird at my D, at that fickle finger of fate, and say SCREW YOU, DISEASE! I'm still okay. Sometimes it's uphill, sometimes I get lucky, but I'm doing perfectly okay. So bite me. And pass a spoon. I'm smiling. I love your tradition of having a reflective D new year. I don't think it's ridiculous to cry at good news and "it's my party and I'll be high if I want to" is an awesome mantra! 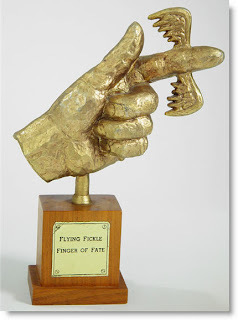 I bet the real Fickle Finger of Fate is a middle finger. Also: Hannaford! I miss those stores! Congrats on 17 badass years!!! Happy Diaversary and or D New Years! Continue to be fabulous, and go grab yourself a cupcake!